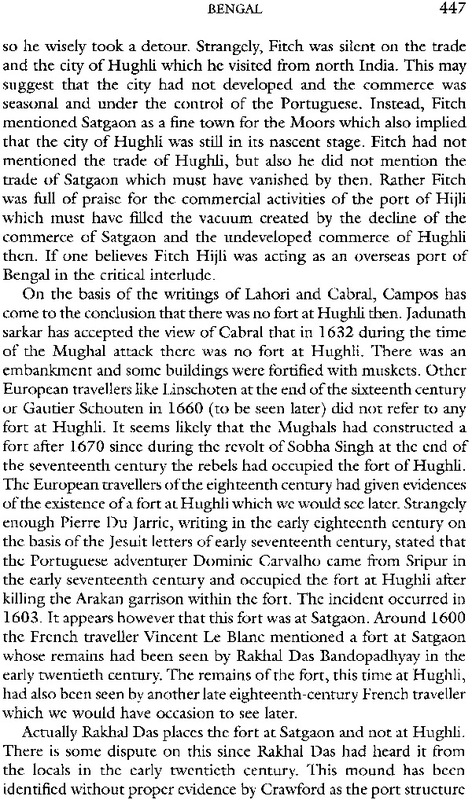 This much anticipated of towns and cities in medieval India from the early thirteenth to the late eighteenth century. The selection is based on the availability of documents. These include the narratives of European travellers in English, French, ltalian, Dutch, and German with the exception of Ibn Battuta in mid-fourteenth century and also Middle Bengali literature case of towns in Bengal. While the coastal towns and cities have been looked at, the interior ones are also described on the basis of the writings of later historians and archaeologists. Aniruddha Ray (b. 1936) studied at the Presidency College, Calcutta, in 1964 he left for research at the University of Paris, Sorbonne and returned to Calcutta in 1967 with a Ph. D. degree. 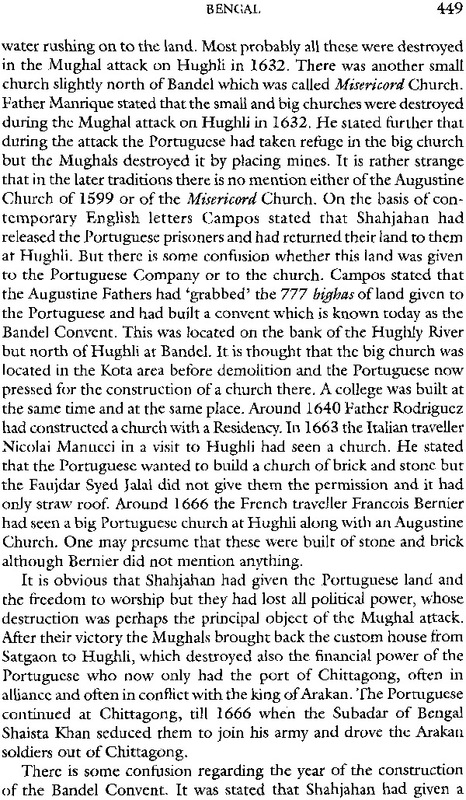 He joined the Department of Islamic History & Culture, Calcutta University in 1968 and retired in November 2001. He was elected President of the Medieval Section of the India History Congress in 1982 and became the General President in 2011. He was the President of Paschim Bangal Itihas Sansad for six years. He was awarded a gold medal with a citation by The Asiatic Society, Calcutta for his life-long contribution. Prof. Ray has published more than 200 papers in English and Bengali both in India and abroad. 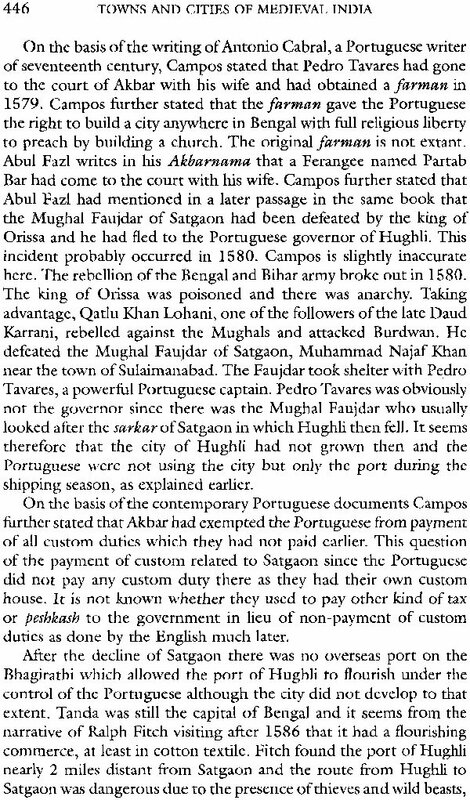 He has more than 35 books in English and Bengali including The Merchant and the State: The French in India, 1666-1799 (2 vols). His last book in English was Bareilly Rising (1857-1859) and the Bengali Babu. Long back Professor Ashin Dasgupta asked me to write a book in Bengali on medieval cities of India for a historical series. I am happy to say that I could finish it before his untimely demise. Prof. Subhas Ranjan Chakbrabarty, who took over the project, told me that he read a portio9n of the manuscript to Prof. Dasgupta who warmly gave his consent to publish it. This was published in 1999 and subsequently reprinted in 2007. Some publishers from north India wanted a Hindi translation of this book, but I preferred an English one as then I would be able to modify some portions and add some more myself. Some of my friends approached Mr. Ramesh Jain of Manohar Publishers who immediately agreed to publish an English version of the book. But I wanted to rewrite the book with some new fact that would alter the picture to some extent. I also wanted to include some new chapters and sections on towns on which I have worked since 1999. Therefore, this book is not English translation of the Bengali book and there some modifications of my earlier views. 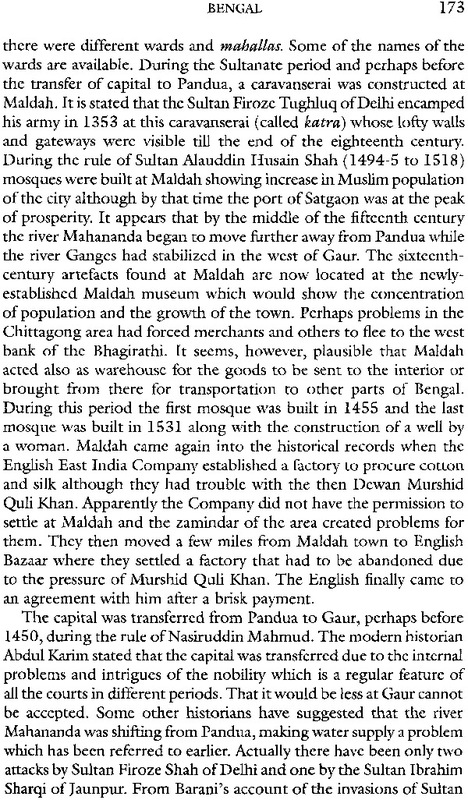 History of Patna and Burdwan has added here. A work of this size requires the help of many people. I am most grateful to Prof. Subhas Ranjan Chakrabarty for constantly encouraging me to write. He was instrumental in seeing the Bengali book through the press. I am most grateful to the staff of the Asiatic Society Library at Kolkata for often supplying me with rare and mutilated copies of old books. It seems to me that they were aware of the urgency shown by me. I am also thankful to the staff of the Rare Book Section of the National Library, Kolkata, for helping me to get rare books atshort notice. Many of my notes are taken from books I found in Bibliography National, Paris and I remain grateful to the staff of that libarary as well as to the staff of the national Archives of France, Paris for supplying the manuscripts. A number of my friends and students have helped me to prepare this book. Among my friends, I may cite the help and encouragement provided by Prof. Irfan Habib, Prof. Shireen Moosvi and Prof. Syed Nadeem Ali Rezavi – all of Aligarh Muslim University, Prof.Dwijendra Narayan Jha, former Professor of University of Delhi, Prof. Ratnabali Chatterjee, former Professor, Calcutta University, and Prof. Tirthankar Chatterjee, former Reader, Kalyani University to all of whom I remain highly obliged. I am also grateful to Prof. Subrata Roy of Santipur College, who took the trouble of going to the libraries and getting the required pages photostated or written down by hand for me. He also could procure some books worthy of notice. Given the condition of my fading eyesight that prevents me from reading in any library, this service will be remembered by me for the rest of my life. Dr. Debraj Chakraborty, now a teacher at Rabindra Bharati University, has helped me in various ways. I am most grateful to Sri Pratip Kumar Mitra for supplying important information's. Last but not the least I must record my gratefulness to late Prof. Ashin Dasgupta for asking me to write this book in Bengali which perhaps I would not have taken up otherwise. I am also thankful to Shri Ramesh Jain and his able staff at Manohar Publisher & Distributors, Delhi, for priting this book with care in quick time. Despite my best attempts some mistakes may have crept into the book. I am alone responsible for all such mistakes. 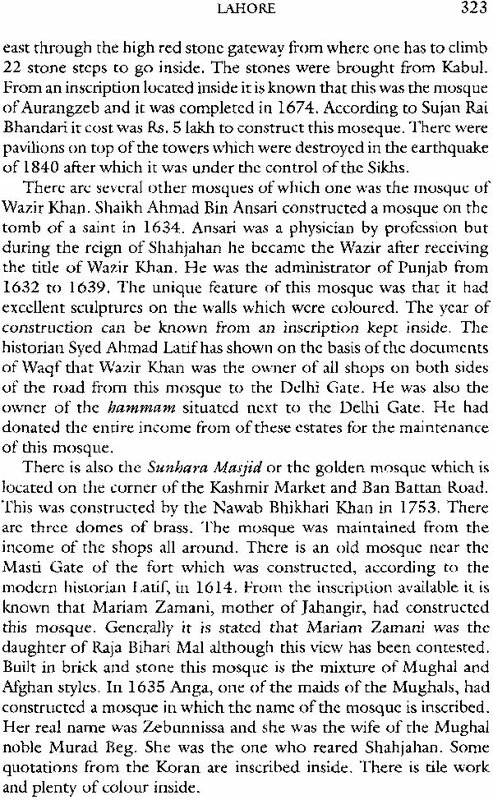 Since my old friend at Aligarh Muslim University Iqtidar Alam Khan has provided me with much information on towns in north India, I take this opportunity to dedicate this monograph to him. I am much obliged to him for his kindness to me at all times. 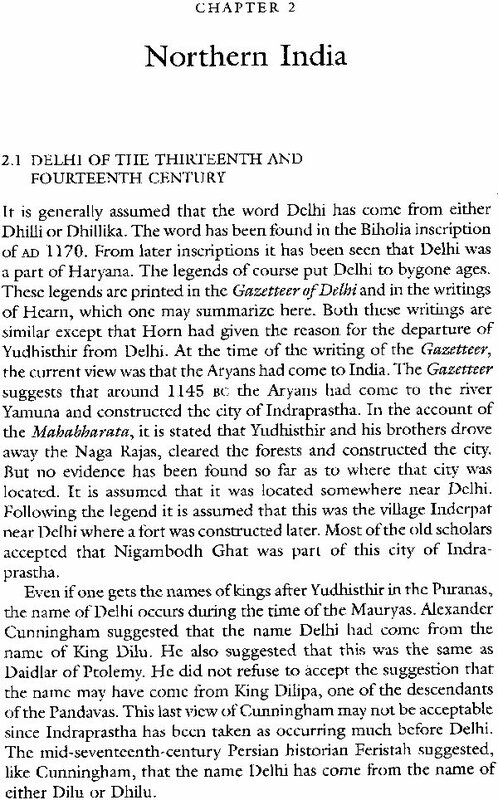 Various kinds of towns and cities have sprung up in the Indian subcontinent since the earliest times. But the history of urban settlement in India is not continuous, leaving gaps in chronology. The mid-seventeenth-century French traveller Francois Bernier had termed the Indian cities as nothing but military outpost that was partly repeated by Max Weber in later years although he had conceded that there were administrative towns in pre-British India. Indian historians today hold a different opinion but proper analysis of such towns of medieval India is yet to be seen. 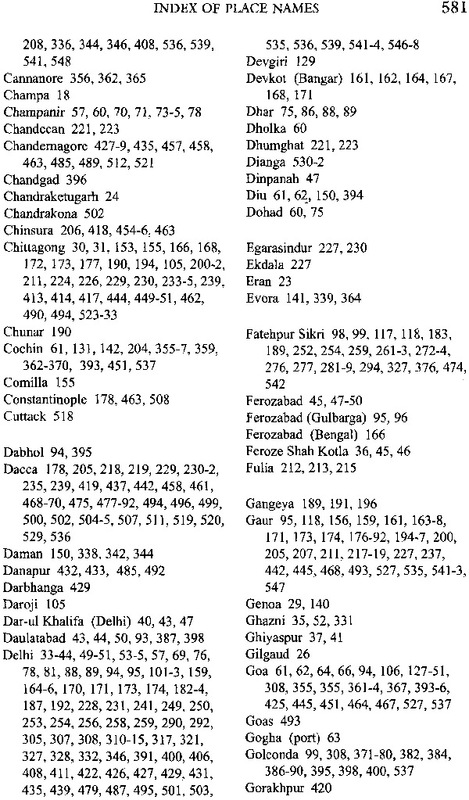 In this monograph an attempt is made to survey the important towns and cities in different parts of the Indian subcontinent in both the Sultanate and the Mughal periods, starting from approximately AD 1200 till AD 1765 when the English got the Diwani of Bengal, Bihar and Orissa from the Maghal Emperor Shah Alam II. At one point of time in recent past it has been asserted, obviously to show the superiority of the Western European civilization, that India was an agglomeration of villages. This is obviously an inaccurate estimate. In recent years India has more than twelve thousand settlements each containing more than five thousand people. From that point of view the Indian civilization is the largest civilization dependent on urban settlements. The number of people living in urban settlements in India is far more than the people living in the towns of America. In 1981 the number of small and big towns in India was more than three thousand. Unfortunately there has been very little work on the urban settlements in India despite its glorious past. There been some publications earlier on urban settlements at the initiative of the Urban Associations earlier on urban settlements at the initiative Urban Association of India; it has practically stopped working in recent years. In 1915 Patrick Gedes of Bombay University started working on urban settlements from the point of view sociology. Some geographers and sociologists started working after 1920. Some studies on urban settlements came out during the decade of 1930 from the Madras Geographical Association in their journal. After 1947 work started with new energy and often with new perspective. The geographers and the sociologists mainly spearheaded this new effort. 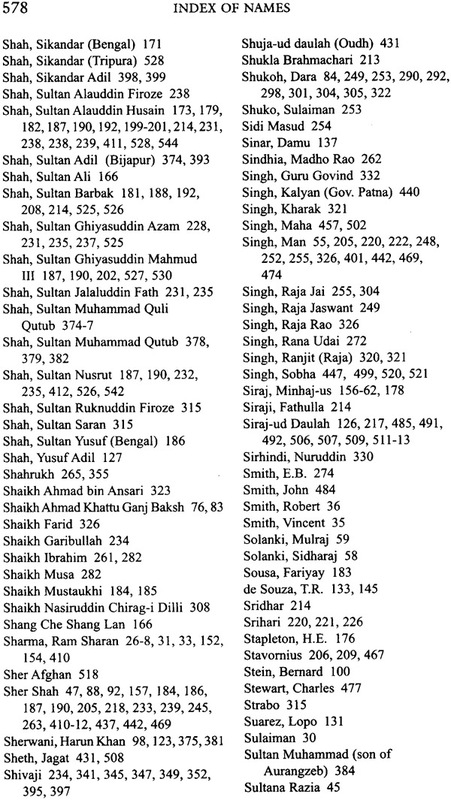 By 1970 geographers had published more than forty books on Indian towns in which history occupies an insignificant part. 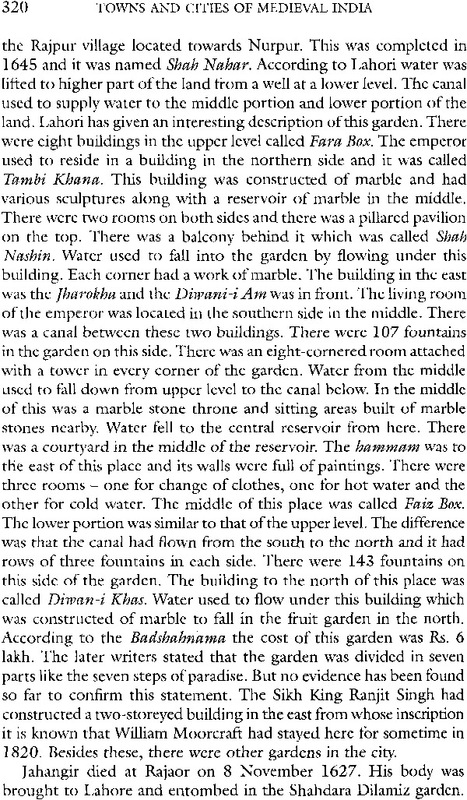 These writings, particularly those of the earlier years, were on individual towns or cities. Some English officials had already written a bit of history of those towns and cities but these were principally narratives and on the political history of urban settlements. 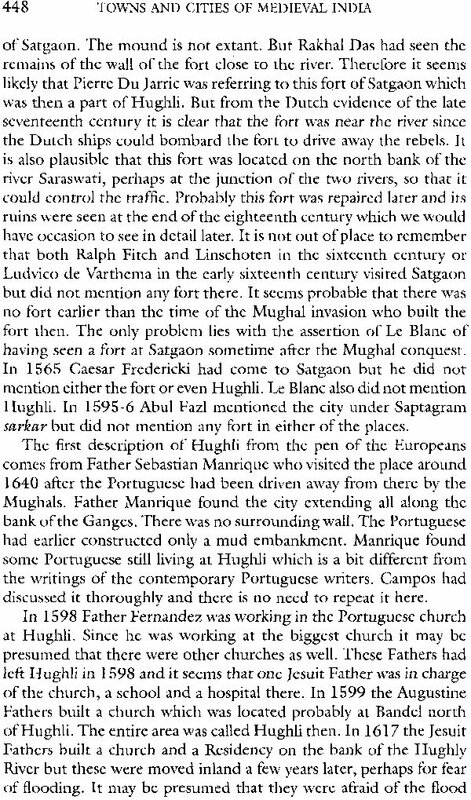 However, history of some pilgrimage-towns was written to show the social formation, or on port-towns for the economic condition of the area. But these are rare exceptions. 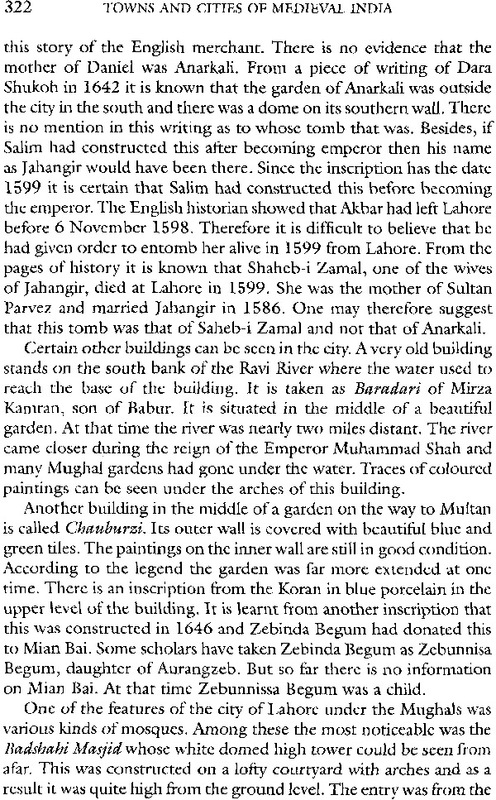 Either history of provincial headquarters or that of the capital was written from dynastic history. On the other hand, the geographers gave emphasis to the geographical features of the area in which the city was situated and that too near their times. These are necessary to understand the changing features of the city but unfortunately very few studies have been done on the changing courses of the rivers on which the towns were situated. 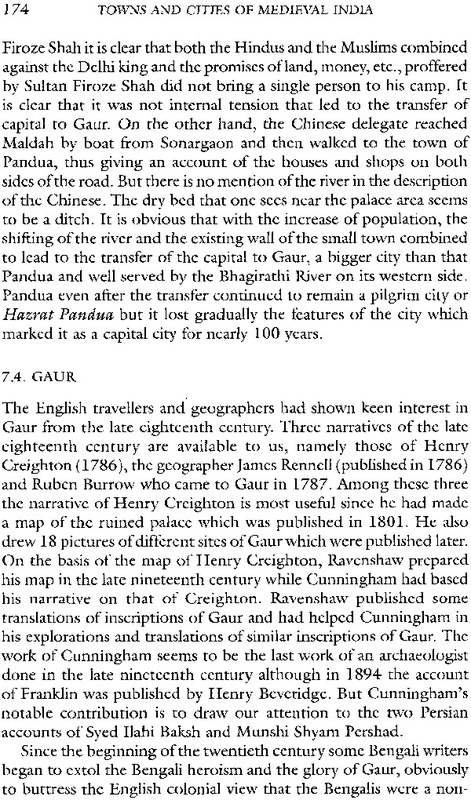 The Gazetteers, generally written by the English officials in the early twentieth century, had marked the courses of the rivers but their narration of historical events was based on limited information available then. As a result the history of the cities and towns of India, particularly in the medieval period, has remained still unwritten. Furthermore, the Gazetteers written by the English officials have a tendency of looking at the history from a bi-polar point of view - the Hindu-Muslim conflict in the medieval period, a trait that was noticeable even among some archaeologists of those days. This was the effect of the Mutiny on the minds of the English officials and the historians of late nineteenth century. The work of the geographers would have been of inestimable value in finding the physical features of the towns of bygone days and their social and economic formations. In the beginning the geographers started looking at individual towns, but soon they were influenced by the works of the American geographers to look for the centre of the town - the downtown - the business area, along with statistical tabulations of the population and other features of their times. There was an effort to find the pattern of towns of a particular area. Whether such methodology can be applied to the towns of medieval India with their multicuItural traits and population is a debatable point. But in these efforts certain questions crop up which were not there in works of earlier times. For example, one can now try to find out the relation between the town and the hinterland, the centre of the town, its physical features, etc., which in certain cases help us to understand the reason of the decline of certain towns. Therefore one would need a collective effort of geographers, historians and sociologists, for example, to determine the history of towns in detail and from a comprehencive perspective. The availability of maps from different sources has certainly helped but there are really very few applications of geographical methods in writing the history of towns in recent years although Fernand Braudel had advocated its use long back. Actually the scholars of the late nineteenth and early twentieth centuries were far more aware of the influence of geography on history than those of recent days. The works of Jadunath Sarkar and Nihar Ranjan Ray are the fine examples of such understanding. But even then all questions could not be answered at the present state of our knowledge. The process of the establishment of the first urban settlement in India is not yet absolutely clear. The establishment of the first urban settlement in the Indian subcontinent in about 2500 BC could be termed as the Harappan civilization. These urban settlements continued till c. 1700 BC or for nearly 800 years. After this there was a gap in the construction of the towns except perhaps in some areas of northern and southern India. After that one gets contemporary history of towns in India. There we see that the towns had existed with some amount of prosperity between 300 BC and AD 600. It is also certain that many towns began to decline after the rule of the Guptas. It has been assumed that after AD 1200 there was a spurt in the rise of towns. Since the second half of the eighteenth century some towns declined and some new towns began to come up as shown by C.A. Bayley. These new towns were connected with the English East India Company. 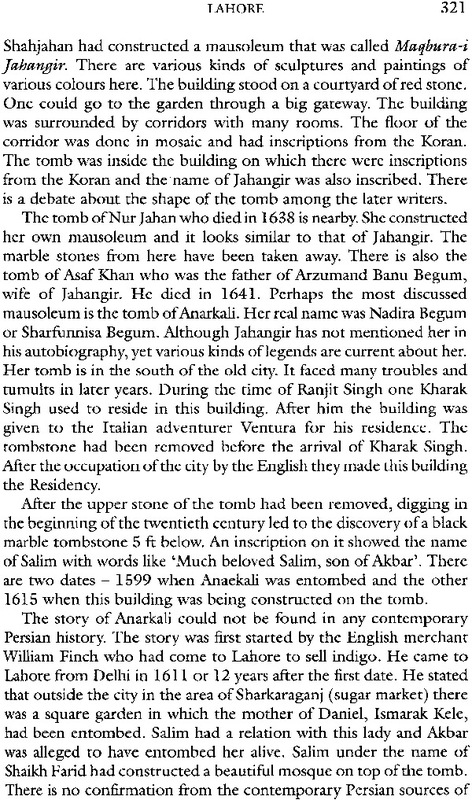 More or less all the eminent scholars have agreed that the first 'Urban Revolution' started in the Indus Valley in which one may add a portion of Rajasthan, portions of the Punjab and western United Provinces. Later during the second 'Urban Revolution' towns began to emerge in the middle Gangetic Valley and parts of south India. But this does not mean that constructions of towns throughout north and south India have continued unabated. In some areas there were huge gaps between two towns which was an usual picture of the times. Scholars are still writing on the Indus Valley civilization and its birth. 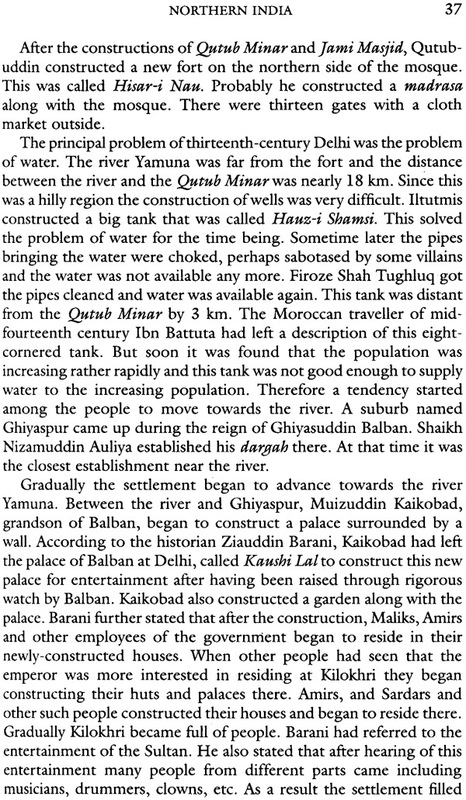 At one time it had been postulated that it had started in Baluchisthan and gradually spread to the Indus Valley. But this view has not satisfactorily been accepted since it has been found that Baluchistan civilization was far more embedded in agricultural orientation that failed to transform into an urban culture. The noted archaeologist Gordon Child had given some reasons to explain the rise of the Egyptian and Sumerian civilizations which could be seen in case of the Harappan civilization. According to him the extraction of metal from iron ore and the enormous production of agricultural products created international commerce. This situation coul not be applied to the situation in post- Harappan age. One reason could be that the limited use of the metal in Indus Valley civilization prevented it from going the Egyptian way. 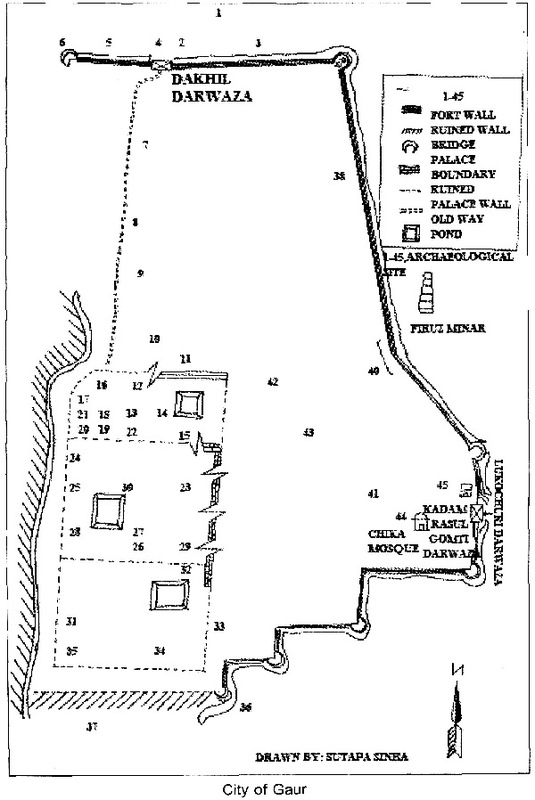 As a result the rise of towns could not be seen in the post- Harappan age. 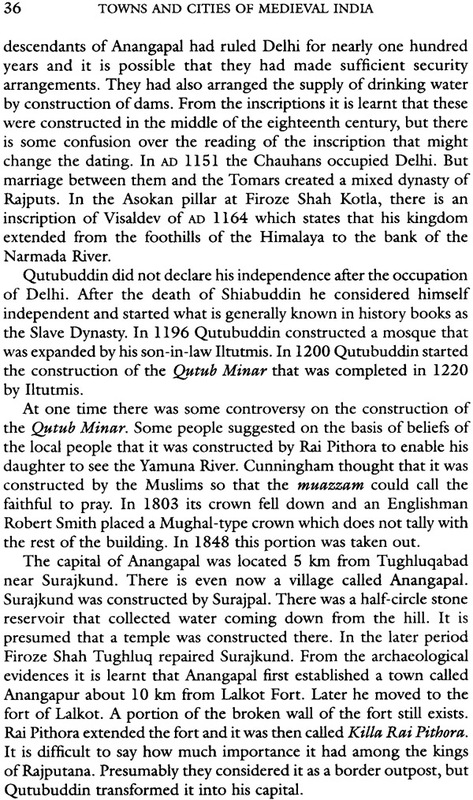 Some towns in north India began during the first period of Historical Age and their history is not unknown. By that time the Rigvedic age had been succeeded by the Vedic age. 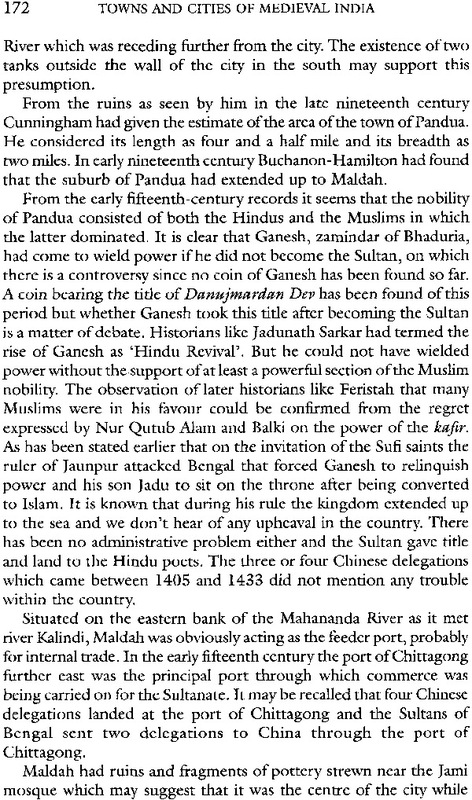 From the north- western frontier the focus had shifted to the east of Indus River and was moving towards the north of the Gangetic Valley. This movement gradually moved further east and the south. The spread to the plains of northern India brought before the visitors golden opportunities to expand. The formation of kingdoms and the features of kingship also became clearer while the people were becoming far more dependent on political and geographical entities. The earlier inhabitants of these areas had some particular spaces in these areas. But their positions were far lower both socially and politically from those of the visitors. These colonizers are called Aryans for their different language and culture although there is controversy over the use of the term. In the south of India the new language and culture did not receive much importance and in the east it took some time to arrive. Obviously there interactions between the colonizers and the earlier inhabitants resulted in many areas in the creation of a mixed culture including language and perhaps religious ceremonies. From the point of view of archaeology, one finds grey painted ware in the Ganga-Yamuna Doab area during the same time. Whether these were brought and used by the visitors could not be properly determined, but during the next period it has been assumed that the visitors had used these wares since these are available from the geographical areas. The carbon dating of these wares fixed the date between 800 and 400 BC which tallies with the dates of the visitors. Therefore during the end of Vedic period, these grey painted wares were in use particularly by the visitors. It may be mentioned that the use of iron had brought significant changes in politics through the military use of Damascend swords and the use of horseshoe in the cavalry, enabling covering a wider area in short time. The clearing of jungles in Ganga-Yamuna Doab was made possible by the use of iron giving in turn the opportunities for the rise of kingdoms. Agricultural production increased due to the use of iron on the tip of the plough, although it has been pointed out that very few peasants could afford the highly-priced iron tips. The cutting down of blocks of solid rocks was made possible by the use of iron under the patronage of the royalty that helped to establish dams serving broad irrigated areas and increasing agricultural production. The union of agriculture and crafts in the urban areas helped commerce. There is no doubt that iron was far better than copper or bronze which could also be seen in the establishment of greater defensive walls of the cities with solid stone blocks. Whether the use of the new metal had changed the social formation in the urban areas is difficult to say. But we see during these times the rise of new kingdoms with recognized ruling groups. All of these newly-emerging kingdoms had a capital which was different from the small urban settlements established when iron was first used. The archaeological explorations of the earlier small urban settlements showed that those were not in real terms urban areas, but the headquarter of rural areas. 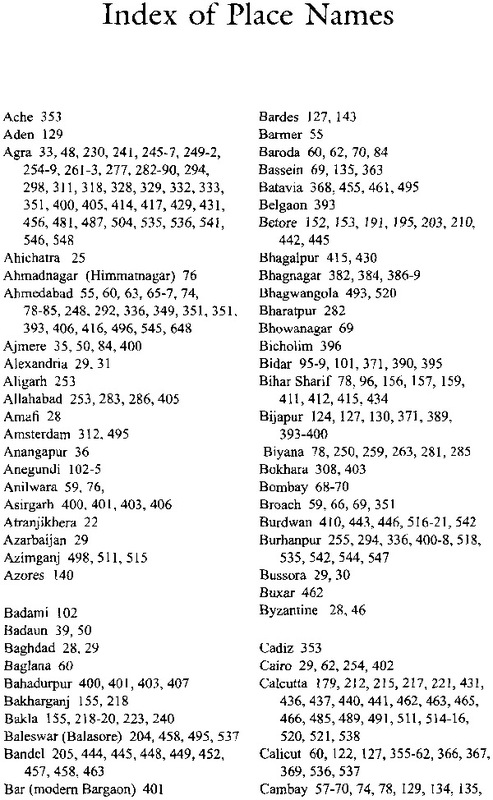 There are exceptions in case of Kausambi (c. 1000 BC) and Ujjain (c. 750 BC). The ruins of forts of these two places have been found. One may postulate from the ruins that these were constructed much later than the time assigned so far. It may be emphasized that sixth century BC was the turning point in the history of north India. Generally this age has been assigned as the pre-history age when sources have found on the dynastic history of the kings or on the history of religious movements and their leaders. It is to be debated whether any particular tern should be imposed on this period when technological changes, rule of the well-known kings and new religious movements coincided to create a different milieu than either history or later ones. The geographical identities and their features are clearly discernible. Out of these some settlements like Abanti, Koshal, Kagadha were being transformed. The religious movements of Buddhism and Jainism emerged in the Gangetic Valley during this period and from the writings of the devotees of these two religious we get principal information on these settlements. 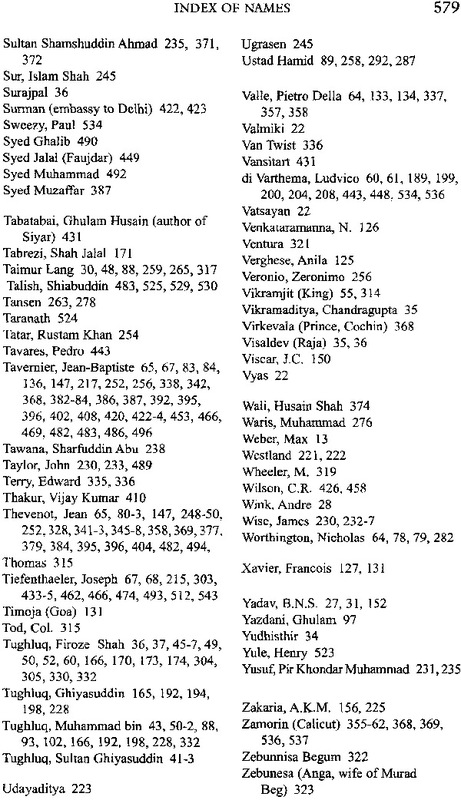 Among these Magadha established the firs empire with the Nanda and Maurya dynasties. At this stage we notice certain changes, the first of which was the introduction and circulation of coins. There is no controversy over the fact that the introduction of coins helped commercial transactions which in turn would help to improve communications including roads. The introduction of silver coins is significant since silver comes principally from outside India through commercial exchanges. After the fall of Harappan civilization such circulation of silver coins is seen for the first time. 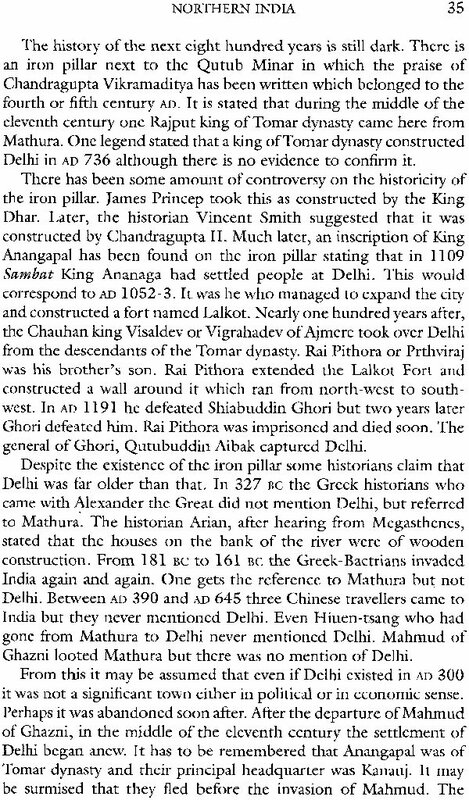 We see again the use of iron the Harappan civilization. From the third century BC we get the polished painted black weres which extended from Gangetic Valley to Taxila in the north-east. Needless to say without the expansion of commerce this would not have been possible.